Your pet deserves reliable, safe medical care. At Hartland Park Animal Hospital in Lexington KY, we provide medical care for pets of all ages. Our caring, specially trained staff treats our pet patients like they’re family. From the moment you take your pet to our Lexington vet, we'll do our best to ensure that your animal is comfortable, healthy and safe. Our state of the art facilities are designed to handle pets suffering from a variety of conditions, from cancer to broken bones. 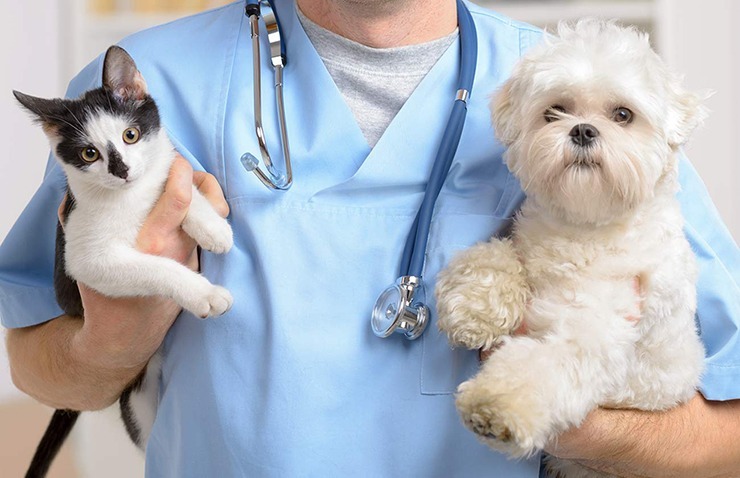 Our veterinarian, Dr. Cundiff, is committed to ensuring that pets in the community are given the pet healthcare they deserve. As the winner of the prestigious Westminster Kennel Club Foundation scholarship in 2006, Dr. Cundiff is a respected veterinarian in our community. Because we offer a wide range of services, your pet will always have the option of going to the same medical provider. This helps ensure that your pet will develop a healthy comfortable relationship with the vet in Lexington. Pets need preventative care in order to avoid serious illnesses and diseases. We recommend that all pet owners bring their pets in to the veterinarian at least once annually for their pet exams. This preventative visit helps Dr. Cundiff determine the status of your pet’s health. Wellness exams helps catch chronic conditions and diseases in their early stages, so your pet can get the treatment he or she needs in order to stay healthy. In addition, our preventative services include spay and neuter services, dental care, pet vaccinations and dietary counseling. When your pet is suffering from an injury or a disease like cancer, surgical procedures may be necessary to help your pet make a recovery. We provide anesthesia to pets before surgery to help keep them calm and safe throughout the surgery. When your pet’s procedure is finished, we’ll ensure you know how to care for your pet at home through the recovery. Pet dentistry stops the spread of gum disease and can stop the spread of infection throughout your pet’s body. Our pet dentistry services include tooth extractions, dental examinations, dental cleanings and more. Sometimes pets need emergency care. If your pet is involved in an accident, ingests a toxic substance or gets into a fight with another animal, you may need to bring your pet to the vet for stitches, medicine and more. We provide emergency care services to pets in Lexington KY. Along with preventing unwanted puppies and kittens, spaying and neutering your pets offers lots of health and behavioral benefits. Spaying can help prevent breast tumors and uterine infections in female animals. For male pets, neutering can help prevent some prostate problems and testicular cancer. Neutered pets are less likely to miss behave or roam away from home as well. Come to Hartland Park to have your pets spayed and neutered to prevent future costly problems. Unfortunately, our pets sometimes find their ways out of our homes and into unfamiliar territory. The best odds for you getting them back come from your pet being microchipped. If your pet is microchipped and they get taken to a vet or humane society, it will be easy for someone there to look up the chip ID and help get your pets back to you. We can help with both chip implants and registration, so you won’t have to worry about losing your furry friends. Preventative heartworm medication needs to be given every month if you’re using a pill or topical method or every six months for an injection. Heartworms are very dangerous to your pets and can often be unsymptomatic, so it’s important to regularly administer their preventative medicine and get them tested. Heartworm treatment is much more expensive and agonizing for your pet, so it’s important to prevent it if you can. We can help you choose the right method of prevention for your pet. Just like humans, pets need vaccinations to prevent harmful diseases that are very expensive or difficult to treat. Your pets need a variety of vaccines to protect against dangerous conditions like rabies, parvovirus, distemper, and hepatitis. The age of your pet will determine what shots are needed and how often they need to be administered. Rabies vaccines are the most common, and most states require by law that your dog is vaccinated for rabies. We can help make sure your pets are protected from these harmful diseases by creating a vaccine schedule for your loved ones. As your pet’s veterinarian in Lexington, KY, we can help your pet get the services he or she needs from a young age. Getting your pet preventative services when he or she is still young can help ensure that your pet will start life healthy and strong. We recommend that all pets see the veterinarian at least once annually. To make an appointment, contact us online or call us at (859) 245-7387. Nicole has been a veterinary assistant since 2004. She has been working with Dr. Cundiff since 2011. When she is not at the clinic she and her husband are homeschooling their two daughters. She and her family share their home with 2 cats (Pixie and Lattie) and a dachshund (Parker)......oh and a hermit crab (Special Her). Alicia has been working with Dr. Cundiff since 2012. She graduated from Asbury University with a degree in Biology. She has been a veterinary technician for 9 years. Alicia, her husband and son share their home with a dachshund (Linus), and 3 cats (Skeeter, Kit, and Danny). She enjoys cooking, organizing and spending time with her husband and son. Karen is a native of Louisville, KY. As a small child, Karen knew she would be working with animals. Growing up, she volunteered in shelters to gain some knowledge and experience, and in the summer of 1992 in Alabama, she began her career path. Karen is a 2010 graduate of Brown Mackie of Louisville with an Associates degree in Applied Science. In her spare time, Karen enjoys being the crazy cat lady, tossing balls with her dogs, and hiking and camping with her husband Roy. Spaying and neutering your pets are some of the most important things you can do for your pets, not only to limit the overpopulation of unwanted animals, but also for your pet’s health. In terms of their health, choosing to spay or neuter your pets can be one of the best decisions you could make for your pet’s well being. As pets increase in age, they face an increased probability of developing age-related conditions. Senior pets are typically considered to be small dogs and cats that are 7 years of age, but large dogs are considered geriatric once they reach 6 years old. We all know the holidays come with lots and lots of decorations and wonderful foods. We are here to help make sure that the decorations you are putting up are safe for your furry friends. There’s no need to add more stress to the holidays by having to make an emergency vet visit. Seeing your companion suffering from arthritis and in pain can be difficult. There are a few routes you can take to try to bring your pet relief. In this article, Hartland Park Animal Hospital – conveniently located in Lexington, Kentucky (KY) – is here to provide you with information on complete and balanced nutritional food for dogs. "I would first like to say how compassionate and helpful Dr. Cundiff is- I have taken both of my dogs to him- the 1st was a golden retriever named Carter and he had many issues that we worked through over the years- and now we have a new lab puppy who he has treated and she loves going there. I trust their staff and him they have been nothing but helpful anytime we take any of our animals there." "Dr. Cundiff and the entire staff of Hartland Park Animal Hospital are absolutely wonderful! They treat their patients just as if their were their own pets. Dr. Cundiff is very thorough and explains everything he's doing so that you understand the whole scope of the situation. Every member of the staff is always friendly, helpful and knowledgeable. I would highly recommend to anyone!" "I cannot say enough good things about Dr. Cundiff, and his staff. They are all so loving, and caring, and very knowledgeable. They know my cats, and they make them feel comfortable. Dr, Cundiff knows I am a nervous Mom, and he is very reassuring to me. He is always there for any crisis we may have, and he’s just a phone call away! Do yourself, and your pets a favor, and bring them to Hartland Park Animal Hospital!" "We started going to Hartland Park Animal Hospital after my dog had received a terrible injury to his leg. Dr. Cundiff was recommended to us by a friend (who happens to be a vet tech too!). He saved my dogs life and I will forever be grateful. We have taken all 5 of our dogs to him ever since and have been very happy with everything! The staff is really friendly and it is nice to be able to see the same vet every visit. Highly Recommend!" "Dr Cundiff is the best decision I have ever made for my dogs. He always communicates thoroughly before suggesting a treatment and he always looks for the cheapest way to get the job done. He has called in RXs after-hours for my danes and is never bothered by my millions of questions. I adore Dr C and the wonderful ladies on his staff."